As prog albums go, this is one “from the heart”. 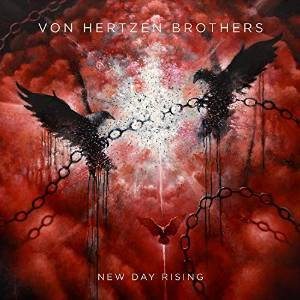 Finland’s Von Hertzen Brothers are at their melodic best on New Day Rising, an ebullient, heartfelt pop prog collection that displays a diversity of musical influence from AC/DC to Pink Floyd. The band are big fish in little Finland, where they’ve topped album charts and won that country’s Grammy equivalent (2006 Best Rock Album). Neighboring Denmark has embraced them as well. But in this country they are mainly known to fans of progressive rock, some of whom have given this latest effort a tepid reception on the basis of it not being “prog enough” and containing too many songs with love as the theme. The job of this site, I’m happy to say, is simply to identify recommendation-worthy music regardless of genre. So whether the VHB’s have lived up to their “prog” credentials or merely created a very good pop rock album, it’s music worth a vetting if you’re a fan of well-made rock music, which is becoming more of a niche genre every year that rap and bad electronic dance music dominate the stateside charts. Check out the video for the uplifting and anthemic “Hold Me Up”. While many of the best prog bands can leave you spellbound with great musicianship or epic songs, the Von Hertzens (also known as an impressive live band) clearly demonstrate a charismatic knack that seems to come from not taking it all–or themselves–too seriously. As drummer Mikko states, “Von Hertzen is German and means ‘from the heart’. That’s what we try to always keep in mind when writing or performing. We feel the music is pretty much useless, if it doesn’t come from our hearts. The point of music, any kind of music, is to create wonderful experiences that are somehow elevating and encouraging. That’s our mission. The music is our instrument”.